In Nepal, where Hinduism and Buddhism have flourished side by side, new forms of the Hindu goddess were invented to show her cosmic nature. Here, the supremacy of the squatting central figure is demonstrated not only by her position and by the presence of many arms and heads but also by the appearance on the upper part of the pedestal of the three chief Hindu gods: Brahma, Vishnu, and Shiva. The body of Bhairava, a fearsome aspect of Shiva, is stretched out directly beneath the goddess. 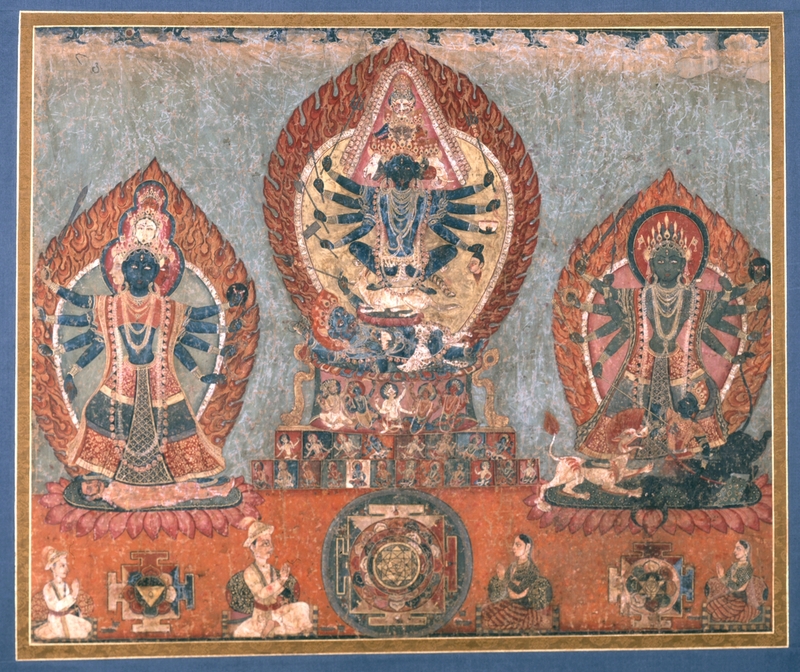 Kali (left) and the warrior goddess Durga (right) join her. At the bottom of the painting, left center, a king pays homage to a "yantra" (magical diagram). This is the king who ruled Nepal from 1799 until 1820. In a ceremony, the goddess was asked to descend into the yantra in order to bring benefits to the king and his kingdom.